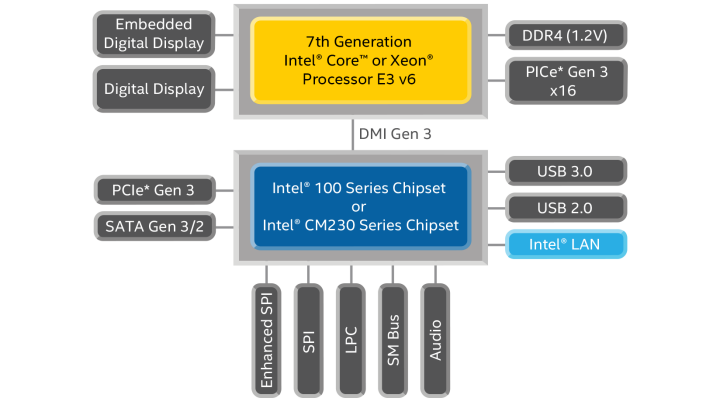 The 7th generation Intel® Core™ mobile processor family and Intel® Xeon® processor E3-1500 v6 product family are manufactured on Intel's most up-to-date and optimized 14 nm technology. When paired with an Intel® 100 series or Intel® CM230 series chipset, these processors offer even greater CPU and graphics performance as compared to the previous generation. The H-series processors offer thermal design power (TDP) options of 45W (with 35W cTDP down), 35W, and 25W, for an exceptional balance of power and performance. The H-series processors are ideally suited for space-constrained and purpose-built designs such as industrial computing, digital signage, public sector and aerospace systems, and industrial automation.